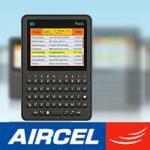 The Peek email device is now available on Aircel’s Network. Peek is a dedicated email device which helps ensure delivery of your emails – personal or official in real time using GPRS, wherever Aircel network is available. It is an email only device and does not support SMS or Voice. Peek supports adding up to 3 email accounts on a single Peek device. These accounts can be from the same domain or different domains. They can all be used at the same time. It can store a maximum of 5000 emails and up to 1000 contacts. It can support attachments up to 10 MB. The new Aircel Peek is priced at Rs 2999. To get Peek, visit your nearest Aircel stores, Croma, E-Zone or Staples stores. On prepaid offers, get unlimited email service for Rs. 897 for 90 days. After the initial 90 days, subscriber can recharge with Rs. 89 for 7 days validity or with Rs. 299 for 30 days validity. On postpaid, pay Rs. 897 for three months of unlimited email service, after three months rental of Rs. 299 per month will be charged. Success of this product is questionable. Blackberry lowest monthly plan is available at 299 (same as Aircel Peek Plan) but offers much more than just accessing email. Aircel Peek allows you to integrate upto 3 email accounts whereas Blackberry allows 10. Offcourse this is much cheaper than a BlackBerry device but then a BlackBerry device offers much more functionality than just allowing you to access your mails. What do you think about this Aircel Peek? Do share your views.